The Ontario Athletic Commission has released the list of fighters who will be suffering medical suspensions after competing at UFC 165. The card took place this past Saturday on September 21st and saw a decent amount of blood spill. As a result of all the punishment, six fighters have been suspended for 60 days. These lengthy suspensions are more of a precautionary measure as they can return to action once they get the go-ahead from a doctor. Jon Jones: Suspended 60 days. Additionally, needs CT scan or MRI, plus x-ray before return. 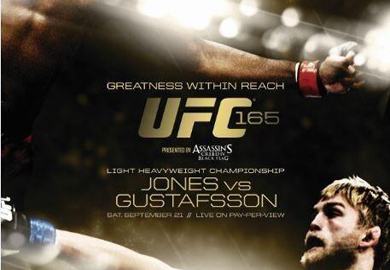 Alexander Gustafsson: Suspended 60 days. Additionally, needs CT scan or MRI before return. Eddie Wineland: Suspended 60 days. Additionally, needs CT scan or MRI before return. Matt Mitrione: Suspended 30 days. Additionally, needs CT scan or MRI before return. Mike Ricci: Suspended 30 days. Additionally, needs x-ray before return. Chris Clements: Suspended 60 days. Additionally, needs CT scan or MRI before return. Renee Forte: Suspended 60 days. Additionally, needs CT scan or MRI before return. Nandor Guelmino: Suspended 60 days. Additionally, needs CT scan or MRI before return.